They simply snap onto the tube and can be rotated or slide into position during layup. 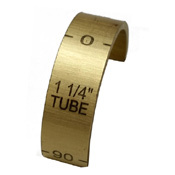 They're a handy way to keep reference especially when rotating or flipping a tube around to make a second cut. A quick and easy rotational indexer.